Peter Goldsbury returned to his tiny primary school deep in the New Zealand bush and here reconnected with its indigenous wisdom. New lessons learnt have allowed him to lay a fresh framework of understanding over more than 30 years experience in project and management roles. Professional Project Managers, who daily face the task of leading a team to make a new future happen, will relate to the massive challenge the tiny Maori community at Te Whaiti faced: What to do when their livelihood, rain forest logging, had come to an end, their spirit was down, their school was failing? The future looked dismal. The school at Te Whaiti Nui-a-Toi drew on their ancient knowledge and values to help them move quickly from the brink of closure to a point where success has become a constant (see their Education Review Office report at www.tewhaiti.school.nz). Their values and beliefs are drawn from Toi - the historical leader of the original people of Te Whaiti. A great discoverer and visionary, Toi established advanced and peaceful communities that shared their art, knowledge, collective wisdom and technology. The school knew nothing of the Project Management Body of Knowledge (PMBOK), but the success of their transformation process proves that they had an innate understanding of the leadership required to make radical projects happen. They share the following lessons with other organisations also wishing to build a unique place for themselves in the knowledge economy. The starting point was a 'live-in', where the school board members gathered and performed a deep self-analysis; growing an awareness of their own strengths and weaknesses before looking outwards. "It provided a catalyst from which our team truly started to function. Everyone had their say and no-one wore their [leadership] hats," said Genevieve Doherty, school principal. Being prepared to acknowledge the chaos of "ground zero" in this way allows any team to build the courage to face the issues together, question all their assumptions, then find and exploit all opportunities for success. In a world where the leaders of organisations are perceived to be individuals (eg CEOs), Te Whaiti re-alerts us to the refreshing possibility of leadership power being shared. A Maori proverb defines leadership for them. "Ma mua ka kite a muri, ma muri ka Ora a mua" - Those who lead give sight to those who follow; those behind give life to those ahead. Maori thinking extends far beyond individuals. School board members say "There is no room for egos around here" and often quote another proverb: 'A kumara (sweet potato) never calls itself sweet - that's for the eaters to say." Earl Rewi, past chairperson remembers, "When I was first appointed chairperson I thought I would crack the place into shape, but quickly found that was not the way to get the board members, staff and community to contribute all their different talents." There is no place for the 'Matapiko gatekeepers' (stingy knowledge withholders, firefighting project heros or prima donnas) in the Tipu Ake environment. Leadership is project-based and success relies on the degree to which people are capable of sharing their knowledge, acknowledging the power of the team, and contributing. This small community of ex loggers has no lawyers, accountants, business people or even shopkeepers, so finding themselves needing to take control of their school was in their words "Very scary stuff." They were perplexed by the complex procedures and language that the educational system imposed. Present chairman Chris Eketone reflects; "We asked them to explain what they meant in simple terms and we wrote all our internal policies and procedures into five coloured books. Now lots of other schools want to get hold of these." Lesson 4 The future is behind you - so sense what is happening around you now. The Maori world view is natural, holistic and very pragmatic. They say that the future is behind you and can only be foreseen by combining the wisdom built up from past experiences (visible in front of you), with the collective sensing of everything that is happening around you right now. This is what gives the group the power to identify opportunities and threats, then to make decisions that move everyone forward. Kaumatua (Elder) Pahiri Matekuare offers advice about sensing: "You can tell when you are off the course, nothing comes and your whole mind goes blank. It's like when you sing a waiata and your voice breaks on you - that's a sign that you should not ignore." Wisdom (intellectual property) built up by collective sensing is taonga (treasure) that belongs to the group and loses its value if it is "sold to" or "stolen by" others. The group has the responsibility to treasure, grow, guard wisely and share its taonga appropriately with others. Kaumatua, Tipene Olsen, speaks of wisdom in an oral tradition: "It is hidden from the naked eye, it is passed on to you, it is inside you and comes first from you looking at yourself. We have a saying Taringa Whakaaro [open your ears] - you are told something once by the elders and if you don't hear you have to go back down and work your way back again. That's how the carriers of the wisdom are found." The concept of copyright ©, developed by societies with written traditions, often fallaciously assigns the copyright and intellectual property to the writer of a document (who may then reassign or sell it to others), rather than to its source, the group that grew it. The success of the school team is driven by its unrelenting focus on outcomes: "Giving our children choices for their futures, that we ourselves may have missed out on." Project outputs like passing assessments and exams are important but are really only benchmarking milestones on the path. Kaumatua, Andy Kohiti explains: "We see life as a whole and the future a place we are connected with through our children. 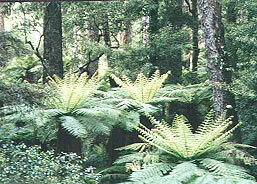 We are the kaitiaki of all the land, forest, wisdom, language, traditions and learning we are given to pass on to them." Kaitiaki derives from kai (food and sustenance) and tiaki (guardian), which says it all. Volunteers from the Auckland University of Technology and elsewhere have been inspired by the people of Te Whaiti Nui-a-Toi and totally in retrospect have helped them capture the essence of their unique project processes in a form that others can share. 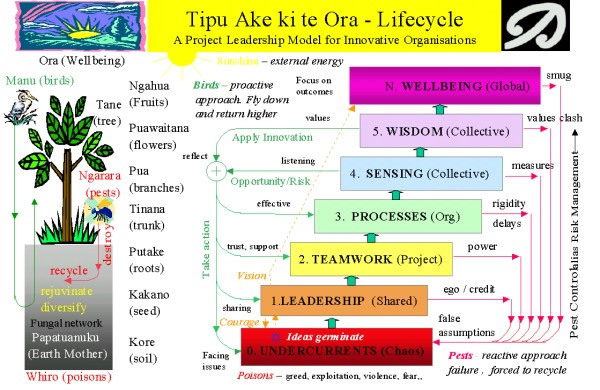 The result is the Tipu Ake Lifecycle, - A Project Leadership Model for Innovative Organisations. Tipu Ake takes its inspiration from nature but embraces much modern management thinking on leadership, teamwork, innovation, flexibility and change. Unlike most other organisational Capability Maturity Models (CMM's), it focuses on promoting effective behaviours rather than defining processes. Tipu Ake begins in the chaos of natural decay, where all new life begins. Ideas germinate in these undercurrents but it takes courage, leadership and vision to push them up. By generating a sense of common commitment around them, we provide the supporting roots for further growth. The trunk represents the organisational processes that provide the structure for growth. This includes much conventional "project and management" thinking, involving structures, processes, policies, funding, and performance measures. This is where most organisations concentrate their efforts. By comparison the three additional levels that Tipu Ake appends on either side of this level rely on strong "leadership". Innovative project teams are like saplings that often must build their own processes to quickly reach the higher levels and gather the knowledge they need to get official support for their cause. Above the trunk, branches spread out, collectively "sensing" progress - putting a sensibility check across the organisation's processes and analytical measurements, understanding customer outcomes, searching for opportunities and containing risks to keep the enterprise on track. Flowering relates to the level of collective wisdom - knowledge that is shared to help pollinate new ideas and respond to rapid changes in the environment the organisation operates within. Fruit represents the level of wellbeing that encapsulates the desired outcomes of the organisation and the main stakeholders involved. It is the "reason for existence" of an organisation and the projects that exist within it. Tipu (growing from within) Ake (ever upward) ki te Ora (toward wellbeing) is not a linear process but a cyclical one. It includes both reactive and proactive cyclic paths. All project professionals will relate to the "pests" that almost daily attempt to re-cycle people to the undercurrents (e.g. an individual ego claiming all the credit, power / politics destroying teams, rigid inflexible processes, measuring the wrong things, value clashes, or letting down our guard. Pest control (alias risk management) is what we instinctively try to do to prevent this fall, sometimes even when a project is dead and further flogging cannot be justified. By contrast on the proactive side we have the "birds", the entrepreneurs who sense what is going on around them, gather in the accumulated wisdom and diversity then reflect on it to voluntarily plant seeds and nurture opportunities to promote new growth at any level. As the lessons above show, Te Whaiti School operates almost totally in the proactive "bird" mode. How can Tipu Ake thinking help project management organisations? 1. One step at a time. 2. Growing organisational capability and maturity by projects. A large organisation (or a nation) is like a forest. It cannot alone say: "I am going to leap to become the largest and tallest forest in the world." Instead, it is totally dependent on the many individual trees that compete for resources within it; the individual projects that will take it upwards. On the other hand a project, like a kahikatea tree seed, can say "I am going to be the tallest tree in the forest and will grow my children around me, being nurtured by and nurturing the others in this forest." Whereas organisations can normally only move slowly, projects can practice the leadership, teamwork, behaviours and processes that will allow them to rapidly climb to the higher levels. 3. Questioning assumptions and exploiting opportunity. "The Tipu Ake Lifecycle is an opportunist perspective for project management professionals. 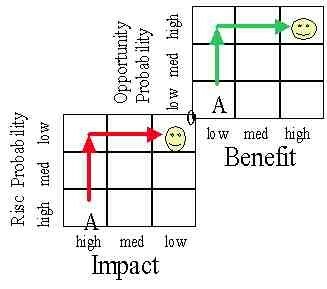 Instead of just the focus on "identifying and minimising risk in the execution stage" that is embedded in linear western thinking, it encourages us to think proactively beyond "the origin" into the fruitful area of opportunity. The model goes beyond thinking project success is limited to delivery on time and within budget; it considers outcomes, providing a path to enhance capability and grow new ideas in the global climate of intellectual wealth and rapid change." The Tipu Ake team of volunteers hope that the model will help others find their own blue skies through the trees. If it works for you please let us know. If it does not we also want to know why so we can learn from your experiences too. The author, Peter Goldsbury is an organisational learning facilitator. He is a Project Mangement Consultant at the Auckland University of Technology. For the content of this story our thanks go to the people of Te Whaiti and volunteers Karen Laugesen and Ruth Wynyard, Communications graduates, Auckland University of Technology who attended the launch of Tipu Ake. Photos by David Somerfield.